Nuts For Nutrition: Have Nuts And Seeds Gotten A Bad Rap? | PrimeYours! Nuts fall into one of those categories of food that has swung back and forth on the spectrum nutrition. Growing up with the nutrition pyramid, nuts fell into the category of “meat alternates” in a time when vegetarianism wasn’t as common as it is now. Since, the 1980s fitness and diet infatuation hit, however, certain foods have swung on and off the “do” and “do not” eat lists. Nuts have been one of these foods due to our current fat-phobia and their relatively high fat content. To draw a line between nuts and seeds is a little confusing, since most nuts are seeds. Then again, some things we call nuts are actually legumes (peanuts) and some things we call seeds are actually fruit (sunflower seeds). To eliminate confusion, I will not be drawing those lines. I will simple discuss the healthiest (and least healthy) nuts and seeds (as they are commonly known) and how you can incorporate them most strategically into your diet. The reason nuts and seeds have stayed on as a “meat alternate” for so long is that they are the best plant (non-meat) sources of protein that you can find in nature. The only difference between meat protein and the protein found in nuts (and some seeds) is that nut protein lacks an essential amino acid (lysine), which can be gained from legumes (peas, beans or peanuts), or animal sources for the non-vegetarian. Nuts and seeds are incredibly nutrient-rich, meaning that you need only small portions to consume very high amounts of nutrients as varied as protein, calcium, iron, Vitamins E and B, anti-oxydents and omega-3 fatty acids. It is this last one that seems to keep throwing people for a loop. It is true that nuts have high oil content (hence the proliferation of nut oils on the market such as peanut, sesame, and coconut), and therefore high fat content, and that you have to keep that in mind when portioning out your daily intake. The majority of fat in nuts, however, is the good kind of fat: mono- and polyunsaturated fats that contain important omega-3 fatty acids. These fatty acids work in your body to lower LDL (bad) cholesterol counts. You have to be careful, however, as good fat or not, high levels of fat in your diet will be stored as fat in your body if you do not expend those calories. Also, while nuts and seeds contain high levels of good fat, some also contain concentrated levels of bad fat. The best way to figure out which nuts and seeds to incorporate into your body is to compare which ones contain the highest nutrients and the lowest levels of saturated fat. The recommended daily portion of nuts is 1 to 1.5 ounces (about a third of a cup), so all of the nutritional information below is based on a one-ounce portion. Almonds are very high on the list of nuts that have an incredible amount of nourishment in a small portion of nut. For 164 calories, you get 5.6 g of protein, 750 mg of fibre, 13.9 g of fat (90% unsaturated), as well as calcium, vitamin E, and iron. Almonds also contain penylalanine, which stimulates brain production of dopamine, adrenaline, and noradrenaline, which all aid in elevating mood. 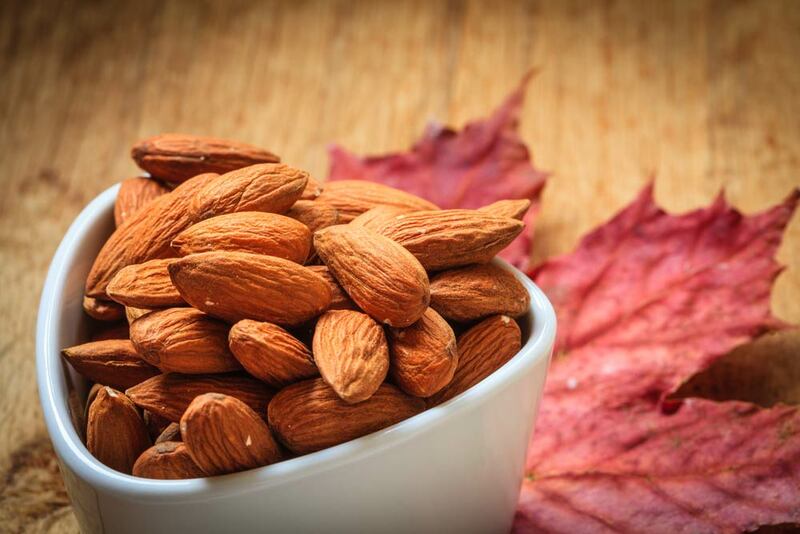 The riboflavin in almonds supports your memory. Walnuts are also great brain food (and actually, kind of look like brains!). In 179 calories, you have 3.8 g of protein, 1.3 g of fibre, and 16 g of fat (93.3 % unsaturated). Walnuts are one your best nut sources of omega-3 and omega-6 fatty acids, and also pack iron, and vitamins E and B6, which support a healthy nervous system. Peanuts have gotten a really bad rap for being high in fat and salt, but that is mostly because of how peanuts are often processed. Peanuts are most likely to have oil and salt added in the processing stages. The fact that you can get so many types of prepared peanuts (salted, roasted, dry roasted, seasoned), means that you need to watch labels for added fat and salt. Plain, unsalted peanuts come in at158 calories per ounce, with 7.2 g of protein, 1.4 g of fibre, and 13.1 g of fat (85.5% unsaturated). Peanuts also contain iron and zinc, and are one of the most inexpensive nuts to purchase. If cost is a factor for you, then buying peanuts to mix in with other nuts is a great way to save money and retain some variety in your diet. Those three nuts have the highest protein content by far, as well as the lowest percentage of saturated fat per serving. Pecans also have a fairly low percentage of saturated fat, but the overall fat content is higher (18g) and the protein and fibre contents are quite low. The nuts with the highest percentage of saturated fat are Brazil nuts (25.5%), cashews (20.6%), and macadamia nuts (15.6%), which also have the highest amount of total fat content at 19.7 g.
The best seeds are also the most commonly found, luckily! Sunflower seeds contain 5.48 g of protein per ounce, while pumpkin seeds weigh in at 9.35 g per ounce. Both seeds are also an excellent source of iron, thiamin, riboflavin, phosphorous and potassium. Fat content in both seeds is primarily unsaturated, although the percentage of saturated is a little higher in pumpkin seeds. Both also contain tryptophan, which is an important amino acid that your brain can convert to serotonin, crucial to elevating mood. Flax seeds are touted as being one of the best seeds for you, as they are one of the best sources of omega-3 fatty acids that you can get outside of fish. Aside from helping to lower bad cholesterol, omega-3 is also believed to help elevate mood. You can find flax seeds in many forms, including oil, seeds, and flour. There are a few intelligent ways to incorporate nuts and seeds in your diet. You can add an ounce of nuts or seeds to many dishes, including yogurt (it’s a great source of protein first thing in the morning), salads (for extra fibre), cereal, pasta or stir-fries, cooked vegetables, and in breads such as muffins, loafs, or even in cookies (replacing chocolate chips). Because of the high fat and calorie content in nuts, it is even better to use it as a replacement item for something in your diet. A handful of nuts is a great snack because of its incredible nutritional value, but also because it is a good filler—that is to say, just a small portion of nuts before a meal can help fill you up so that you are satisfied with a smaller portion. Like any part of your diet, practicing variety and moderation when it comes to incorporating nuts and seeds will not only enhance your palate, it will aid you in getting the range of nutrients your body craves. Like any part of your diet, practising variety and moderation when it comes to incorporating nuts and seeds will not only enhance your palate, it will aid you in getting the range of nutrients your body craves. You're viewing: Home » Fitness & Health » Nuts For Nutrition: Have Nuts And Seeds Gotten A Bad Rap?